This counter height chair features sleek legs and upholstered seats and backs, creating a flawless design that will blend in beautifully with any home. 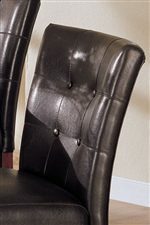 The front side of the chair backs are enhanced with button tufting, while the back sides are accented with detailed stitching. 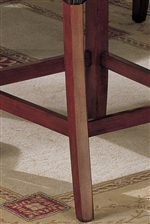 The dark bycast upholstery provides a crisp contrast to the warm color of the wood legs and stretchers. This bar chair will not only enhance the look of your home with elegant design, but provide you exemplary comfort with the thick upholstered seat and back cushions. Pair this dining side chair with the coordinating table to achieve a complete composition for your home. The 7380 Counter Height Chair with Upholstered Seat by Acme Furniture at Carolina Direct in the Greenville, Spartanburg, Anderson, Upstate, Simpsonville, Clemson, SC area. Product availability may vary. Contact us for the most current availability on this product. 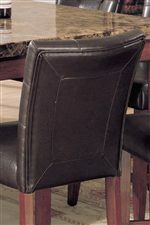 Host your friends and family for a cocktail party or game night with this stunning 7380 collection of dining room pieces. The marble table top of the counter height table adds sophistication, while the square wood legs provide a structured look to the attractive design. The accompanying chairs are counter height with sleek legs and upholstered seats and backs, providing you with ultimate comfort and unforgettable style. 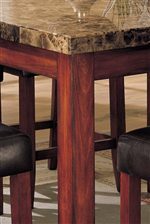 The dark bycast upholstery provides a crisp contrast to the rich color of the wood legs and brilliant marble top. With plenty of room around the square table and a simple classy style, this set will blend effortlessly with any home decor while accommodating your dining needs. The 7380 collection is a great option if you are looking for Casual furniture in the Greenville, Spartanburg, Anderson, Upstate, Simpsonville, Clemson, SC area. Browse other items in the 7380 collection from Carolina Direct in the Greenville, Spartanburg, Anderson, Upstate, Simpsonville, Clemson, SC area.